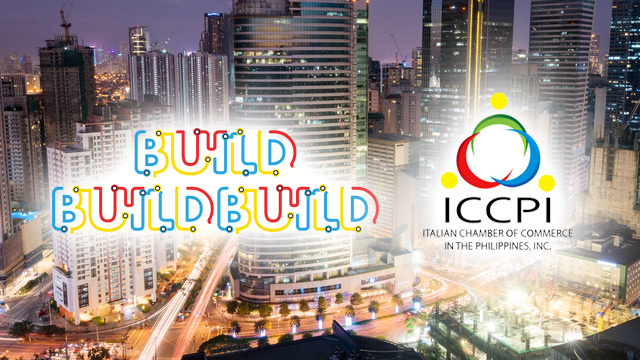 The Italian Chamber of Commerce in the Philippines (ICCPI), a grouping of Italian businesses operating in the Philippines, is spearheading the formation of a focus group that will monitor and examine the various planned and ongoing infrastructure projects of the government. Set to be officially launched on September 24 at Dusit Thani Manila in Makati City, the Infrastructure and Construction Focus Group is set to convene industry stakeholders from the private sector, legal practice and some members of the government. “The idea of creating an Infrastructure and Construction Focus Group is to provide strategic information for industry movers. Currently there is no info platform on where to gather extensive information on infrastructure and construction projects, planned, ongoing and in the pipeline,” the ICCPI said. When President Rodrigo Duterte came into power in 2016, he vowed to implement Php8 trillion worth of roads, airports and bridges during his six-year term that he wants to be recognized as the “Golden Age of Infrastructure.” Some of the flagship projects under program include the Metro Manila Subway, Metro Cebu Expressway and the refurbished and expanded version of the Clark International Airport. To discuss these projects, the ICCPI invited key public officials that play vital roles in the government’s “Build, Build, Build” program to speak during the event. These include Rolando Tungpalan, undersecretary of National Economic and Development Authority (NEDA), Public-Private Partnership Center Director Rois Concordia and Senate Committee Chairman on Economic Affairs Sherwin Gatchalian. European Union Ambassador to the Philippines Franz Jessen will also speak as well as lawyer Anthony Edsel of Gorriceta Africa Cauton & Saavedra Law. ESCA Engineers Inc. CEO Jean de Castro and Philippine Constructors Association Executive Director Barry Paulino will also be there to represent the private sector. Those who are interested to participate in the focus group may send a message to the ICCPI at info @iccpi.org.ph or call (+63) 2 978 0279 or (+63) 917 563 8633.